Golf Takes Off At The Landings! 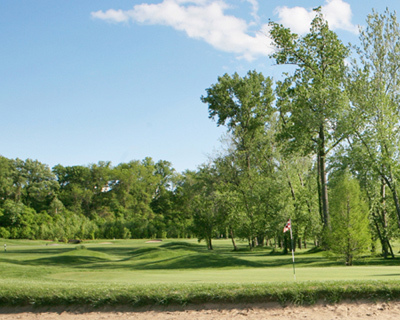 “Golf Takes Off At The Landings!” The Landings at Spirit Golf Club is located in the fertile Missouri River Valley of Chesterfield, between the beautiful bluffs of Wildhorse Creek and the Spirit of St. Louis Airport only minutes from St. Charles, O’Fallon and St. Louis. Designed by Roger Null, The Landings at Spirit Golf Club is an 18-hole championship public golf course with links-style “zoysia/blue grass” fairways and double “bent grass” greens running from 11 to 13 on the stimp meter. Though the course is expertly designed to be a challenge for the highly skilled golfer; there are five sets of golf tees, the "Super Cub" (blue tees) “Super Connie” (red tees) “Phantom II” (gold tees) ”Harrier II” (green tees) and “Hornet” (silver tees) so that we may accommodate golfers of all skill levels. The Landings at Spirit Golf Club, provides affordable rates timed to fit any budget based on the day of the week and the time of day. This sliding rate schedule discounts fees downward as the sun moves across the sky into twilight and the ultra-cheap super twilight. As an added reward every golf player is eligible for our “Frequent Player Card” which earns the player 1 free 18-hole round of golf after completing six paid rounds. Nothing says discount golf like “Free Golf”. Our reputation as the ideal West County golf course for family golf, senior golf, tournament golf, ladies golf, junior golf and league play has set us apart in the industry. Our customers make use of our affordable driving range, and at no cost the one acre practice putting green and a separate practice chipping green bordered by a large sand bunker and a deep pot bunker. The “Landings” team is dedicated to make your entire golf experience a sheer delight from the moment you arrive. Always accommodating, our expert PGA Professionals are available all year to provide private golf lessons and group clinics. While playing, you will thrill at the sight of beautiful corporate and military jet airplanes, as well as the Bluffs of Wildhorse Creek. We invite you to come have a great day with us and enjoy our first class facility - an experience you will not soon forget for Golf, Tournaments, Banquets, Parties and Weddings! The Landings at Spirit Golf Club boasts a complete restaurant facility, the Squadron Room, with atmosphere and great food for your banquet event. You'll have the option of buffet and sit-down service with packages ranging from picnic lunches to steak and seafood dinners. Our facilities may accommodate up to 300 guests. Your meals will be catered in unparalleled fashion as we know how important a good meal is to a successful outing! Call to schedule your personal appointment to learn more! It's a day that you will remember for the rest of your life. Let our team create romance, elegance and class on your special day. From small to large ceremonies and receptions, the Landings provides beautiful scenery for your perfect day. Picture the Landings nestled in the fertile Missouri River Valley of Chesterfield with the tree lined bluffs of Wildhorse Creek Road. Call to schedule your personal appointment to learn more!